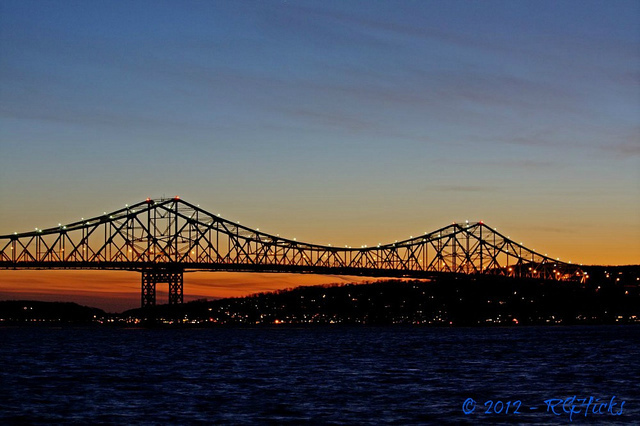 By theLoop | January 14, 2019 View as "Clean Read"
The old Tappan Zee Bridge will be demolished Tuesday, according to County officials, who say the eastern span, closest to Westchester, will be taken down via explosives at 10 a.m., weather permitting. The demolition was delayed from its scheduled time Saturday due to weather. The old bridge’s remaining eastern anchor span is considered too dangerous to be disassembled by workers. Explosives will detonate vertical support columns according to a fact sheet obtained by The Journal News. Severe traffic delays are expected in both directions on Interstate-87/287 and surrounding roadways. Drivers are should avoid the area. 8:30 a.m. – The Hudson River’s main navigation channel will be closed for three hours. 10 a.m. – The New York State Thruway/I-87/I-287 will close in both directions from Tarrytown/Sleepy Hollow (Exit 9) to Nyack/South Nyack/US Route 9W (Exit 11) for about 45 minutes. All traffic will be reopened once the surrounding area is deemed safe. Hudson line Metro-North Railroad schedules could be affected by the demolition, officials said.